The Kilmore House is a striking home set on a large ranch to the north of Melbourne, Australia near the site of the Ash Wednesday fires. Designed by Intermode (the prefab arm of Carr Design), the home is a prototype of the firm's modular, modern home concept. 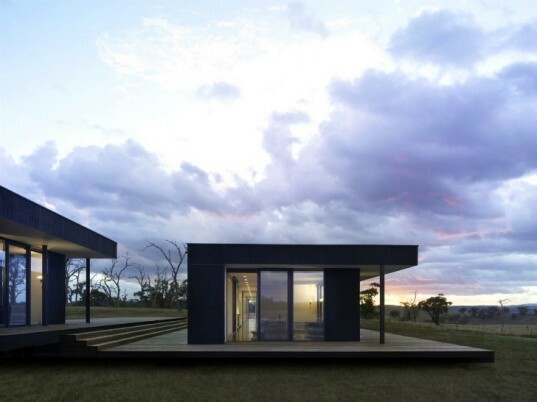 Composed of a series of modular pavilions, the Kilmore House makes use of efficient prefab construction, solar passive design and rainwater collection while creating a strong connection with the landscape. Intermode’s housing model makes use of a variety of pre-designed modules that can be joined together to create homes that are customized for clients’ needs. All homes are based around a 1,200 mm spine wall that contains all the utilities and storage areas freeing up the other elevations for flexible living areas and glazing. Intermode’s modules include a variety of bedrooms, bathrooms, studies, play rooms, living rooms and kitchens that can be lined up together to create one long house or grouped pavilion style. The Kilmore House has a combination of linear configurations and groupings to create the five-bedroom, three-bath home. Located on a 500-acre cattle ranch in Kilmore to the north of Melbourne, the home enjoys a strong connection with the landscape. Floor-to-ceiling glazing opens up the home to views and sunlight, while deep overhangs protect it from overheating. The home was prefabricated offsite and then assembled and completed in a relatively short time. Passive solar design is combined with renewable timber resources, extensive water storage, high performance walls, roof and glazing systems to create an efficient home. 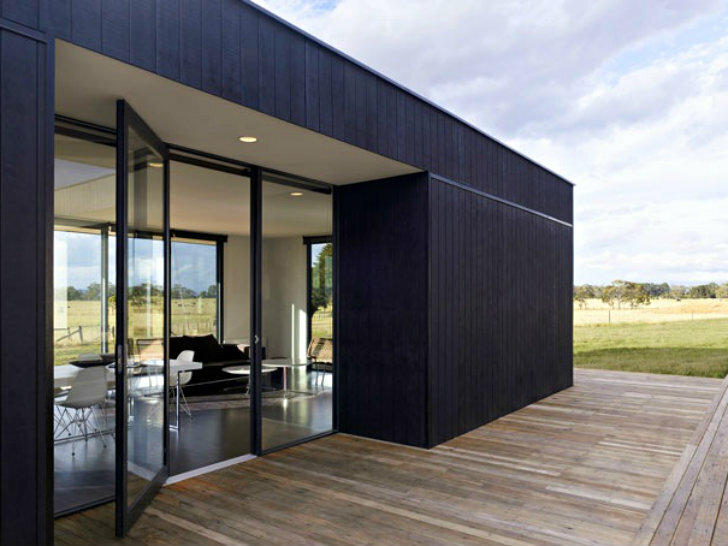 While definitely on the higher end of the prefab market, Intermode’s goal is to build modular home solutions that offer clients elegant, top end design principles at a predictable cost and within a predictable time frame. Intermode's housing model makes use of a variety of pre-designed modules that can be joined together to create homes customized for clients' needs. All homes are based around a 1,200 mm spine wall that contains all the utilities and storage areas freeing up the other elevations for flexible living areas and glazing. Intermode's modules include a variety of bedrooms, bathrooms, studies, play rooms, living rooms and kitchens that can be lined up together to create one long house or grouped pavilion style. The Kilmore House has a combination of linear configurations and groupings to create the 5 bedroom, 3 bath home. Located on a 500 acre cattle ranch in Kilmore to the north of Melbourne, the home enjoys a strong connection with the landscape. Floor to ceiling glazing takes in the views and sunlight, while deep overhangs protect it from overheating. Passive solar design is combined with renewable timber resources, extensive water storage, high performance walls, roof and glazing systems to create an efficient home. While definitely on the higher end of the prefab market, Intermode's goal is to build modular home solutions that offers clients elegant, top end design principles at a predictable cost and within a predictable time frame.